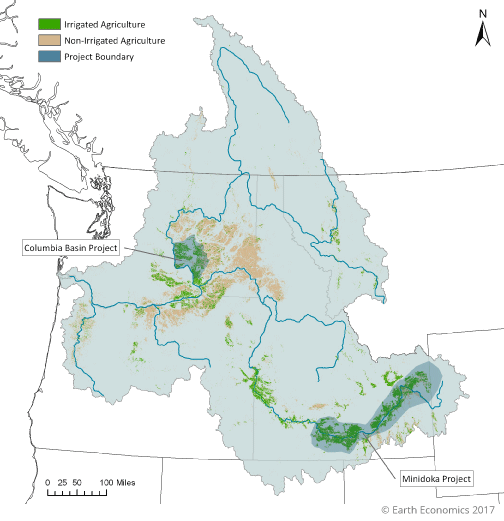 The Columbia River Basin (CRB) is an abundant watershed, supporting immense forests, the largest salmon runs in the world, and diverse and abundant wildlife. These natural resources benefit our region with sustainable food, jobs, recreation, clean water, and a healthier environment, among many others. Yet, these natural resources have been seriously degraded by dams and other developments in the basin. When assets, whether built or natural, are not managed sustainably, economic loss occurs. With a high level of agricultural production in a sunny and arid part of the state, irrigation is the largest non-hydropower water use in the Columbia River Basin. The 2016 CRB Long-Term Water Supply and Demand Forecast reported that between 1981 and 2011, an average of 10.1 million acre-feet per year of surface water was used for crop production in the CRB. It is estimated that only 30% is returned to the Columbia River through field runoff. In addition to more traditionally quantified economic benefits like those associated with agriculture, shipping, navigation, and power generation, the awe-inspiring natural assets of the CRB provide enormous intangible benefits as well - referred to as functions. For this study, we aimed to demonstrate the array of cultural value that the CRB provides to the region’s tribes. Tribal members find a spiritual connection with outdoor activities such as camping, hiking, and swimming. Whether defined as recreation or subsistence, these practices all rely on quality recreation lands and waters. A prime example of these cultural resources is first foods, the traditional foods provided by a functional ecosystem that local tribes have harvested for thousands of years, and that they continue to rely on today as a primary source of sustenance for their families. These foods define nourishment, trade, and health of tribal members, and thus the longevity of the tribes themselves. First foods have always been protected and cared for by tribal ancestors and, in that way, they are also a gift from the past. First foods are recognized under tribal law, a management structure that calls attention to ecological processes that are ignored or greatly devalued outside of tribal culture. The value placed on first foods transcends western economic concepts, and the loss of first foods is directly linked to the health of Native peoples. Research has shown that loss of traditional food sources has put Native American people at risk of diet- related illnesses such as heart disease, hypertension, strokes, and more. For CRB tribes, the well-being of the land and water determine the well-being and prosperity of tribal people and culture. The value of such a resource cannot be defined by western economic terms. We do not place a dollar value on these cultural resources, but it would clearly be unjust not to consider them in our management decisions. Earth Economics worked with Upper Columbia United Tribes, Columbia River Inter-Tribal Fish Commission, Pacific Rivers, Save Our Wild Salmon, and WaterWatch of Oregon to develop The Value of Natural Capital in the Columbia River Basin report that shows the immense economic value of the CRB’s natural assets. In addition, it provides clear evidence of the increased value that can be gained by addressing ecosystem-based function in the CRB river management. Currently, nature’s value in the CRB amounts to $198.8 billion per year in ecosystem benefits. A 10% increase in Ecosystem-Based Functions in the CRB could result in a $219.4 billion per year value in ecosystem benefits. Flores, L., Mojica, J., Fletcher, A., Casey, P., Christin, Z., Armistead, C., Batker, D. 2017. The Value of Natural Capital in the Columbia River Basin: A Comprehensive Analysis. Earth Economics, Tacoma, WA. This study was funded by a grant secured by the Upper Columbia United Tribes (UCUT), Columbia River Inter-Tribal Fish Commission (CRITFC), Pacific Rivers, WaterWatch of Oregon, Save our Wild Salmon.